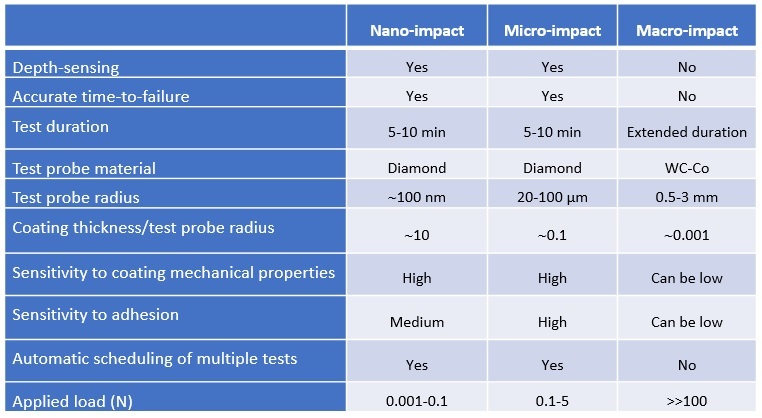 The maximum energy supplied per impact with the Micro-Impact technique is around 2 orders of magnitude greater than the maximum possible in nano-impact resulting in significant damage within a short test time (Figure 2). Acceleration of the probe to the sample surface creates the impact. The impact energy and effective impact force are controlled by varying the static load and the accelerating distance. 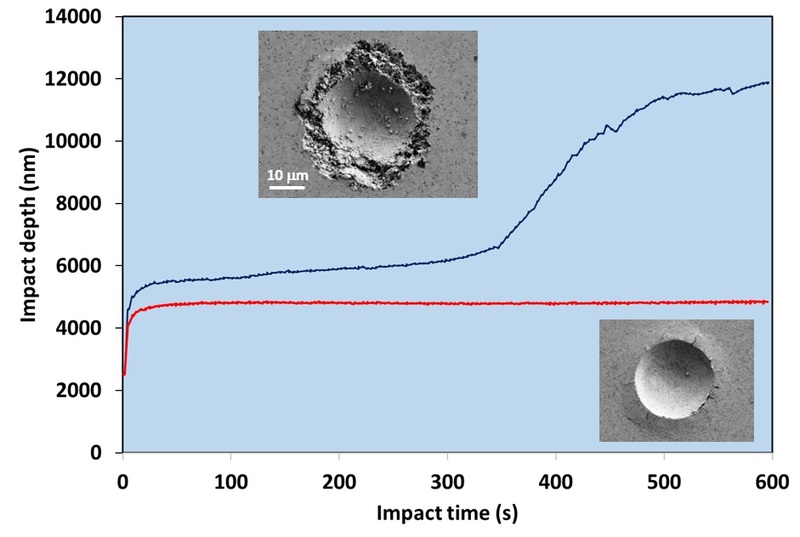 The micro-impact tests were performed with an accelerating distance of 40 microns from the initial surface and the applied load varied in the range 0.5-3 N. The test duration was 300 or 600 s with 1 impact every 4 s. A sphero-conical diamond with end radius 20 µm was used. A major barrier to the greater adoption of low friction DLC coatings in more demanding applications is their low resistance to contact damage. Despite being hard and elastic and performing very well at low loads, typically they behave poorly at higher load. They are susceptible to abrupt increases in wear rate as the load increases beyond a critical threshold . Optimising their resistance to crack initiation and crack propagation (damage tolerance) has therefore become an important research area. Common strategies to improve the resistance to contact damage include deposition of adhesion promoting interlayers, multilayering, changing sp3/sp2 through bias control, gradient layers, metal doping and deposition of load-supporting sub-layers. The micro-impact test provides a quick and efficient method to evaluate new coatings designs. 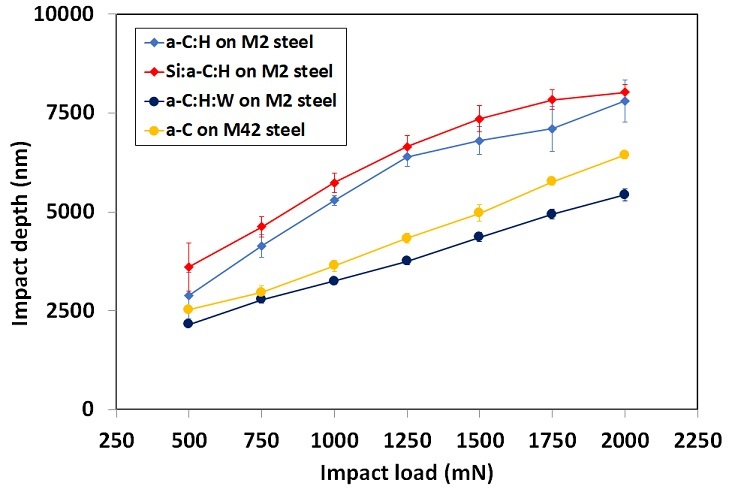 Figure 3 shows the load dependence of the impact depth at the end of the micro-impact test on 4 different types of multi-layered PVD DLC coatings on hardened steel substrate. In this example the a-C:H (the hardest film with highest H/E and H3/E2) behaves poorly, with the Si-doped DLC being even worse. The other two coating systems were significantly more impact resistant despite being slightly softer. 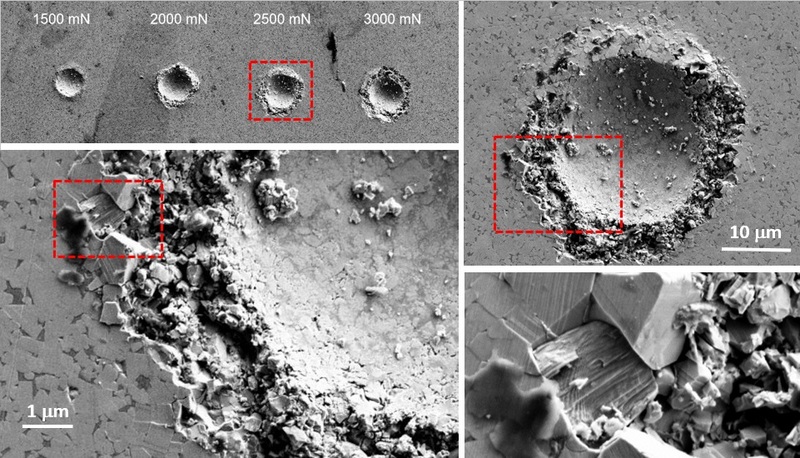 Differences were confirmed by microscopic analysis of the impact craters, as illustrated in Figure 4. At 0.5 N the a-C:H system fails in 3/5 of the 300 s tests and all of the higher load tests. 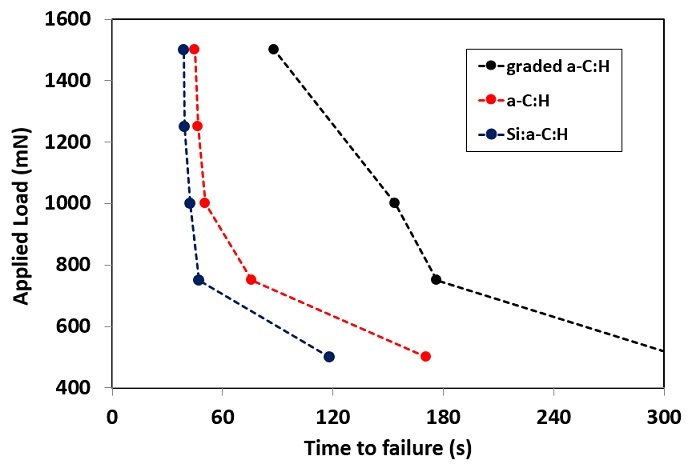 The failure was not observed on the a-C:H:W multilayer. The Micro-Impact test provides an accurate measure of the time and number of cycles to failure so it is possible to produce an S-N curve. Figure 5 shows a typical example for three coatings that show low crack resistance. There are clear differences in time-to-failure with the graded a-C:H deposited by unbalanced magnetron sputtering being more resistant. Figure 6 Comparative impact performance at 3 N for cemented carbide with 4.8% Co binder (red) and 6.0% Co (blue). The WC-Co grade with lower % Co binder and lower Palmqvist fracture toughness displayed improved damage tolerance in the Micro-Impact test with some radial cracking at the highest load (Figure 6). However, the grade with higher binder was susceptible to more severe degradation on repetitive contact, even at the lowest load tested of 1.5 N. SEM images of a typical 2.5 N repetitive impact test on the sample with 6.0 % Co are shown in Figure 7. The differences cannot only be explained by the difference of binder content; in the grade with lower % binder, the presence of cubic carbides inhibit the grain growth leading to different plastic deformation mechanisms. Figure 7 typical 2.5 N repetitive impact test on the sample with 6.0 % Co. The Al-rich nitride coatings AlTiN and TiAlCrN have very similar hardness (H»26 GPa) but their performance in high speed cutting tests of hard-to-cut aerospace alloys (Ni-base superalloy Waspaloy, and Ti-based alloys such as Ti6Al4V) is different [2-4]. Micro-Impact tests were used to simulate the cutting tests . 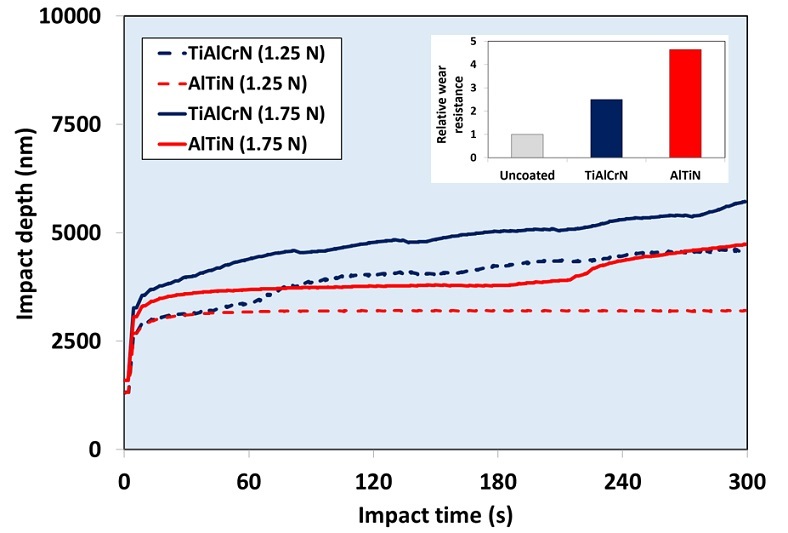 Figure 8 Evolution of impact depth with time for micro-impact tests at 1.25 and 1.75 N on AlTiN and TiAlCrN coatings on WC-Co. Figure 8 shows Micro-Impact tests at 1.25 and 1.75 N. Initial impact resistance at 1.25 N is similar but with continued impacts the impact depth on TiAlCrN increases due to fracture starting at 40 s. Both coatings fail at the higher load but failure occurs rapidly on TiAlCrN whilst the time to failure is much longer on AlTiN. Typical tool life data in machining aerospace alloys are illustrated in the inset for end milling of Ti6Al4V. The repetitive contact in the milling test is effectively simulated in the micro-impact test and the AlTiN displays significantly higher fracture resistance than the TiAlCrN in both tests. The rapid Micro-Impact test can be effective in developing new coatings for these applications. The failure occurs at the periphery of the impact crater where the tensile stresses are greatest as illustrated for TiAlCrN in Figure 9. The repetitive contact impact test reveals differences not observed on initial impact. In many cases damage tolerance under repetitive contact requires an optimum combination of hardness and toughness and since it is generally not possible to predict performance from quasi-static tests a direct approach has distinct benefits. Results from the quick and simple Micro-Impact test have shown a very high level of correlation with actual performance in erosion, metal cutting and other severe applications for coatings and hard metals. 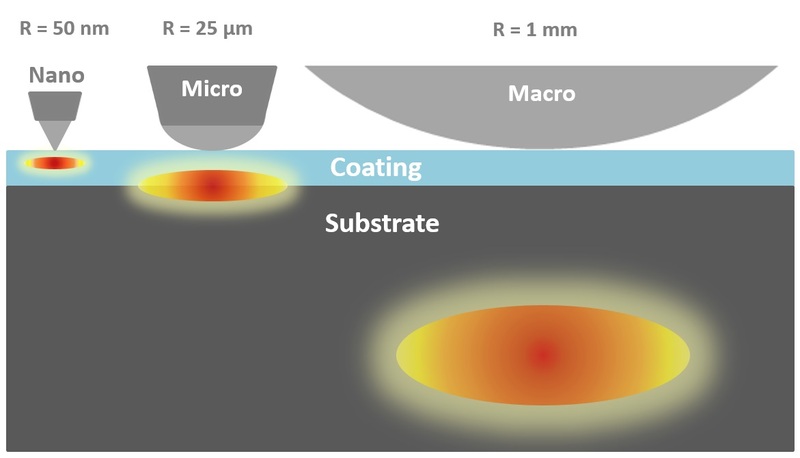 In this complex area the new micro-impact technique is proving a valuable addition to the range of laboratory characterisation tools, reliably screening potential promising coatings systems on the basis of their resistance to fracture on repetitive contact and highlighting potential weaknesses in others (low fracture resistance, weak interfaces…). It can streamline the coating development process, enabling savings in time and money. MML would like to thank Innovate UK and our collaborative partners (Cranfield University and Thin Metal Films) on the project #132369 – Nano-to Micro-Impact Testing: An in-situ test for UK SEAC sector, together with many others who have helped with developing the new technique including Dr Núria Cinca (Hyperion) and Dr Tomasz Liskiewicz (University of Leeds). J. Jiang and R.D. Arnell, Wear 217 (1998) 190. B.D. Beake and J.F. Smith, Surf Coat Technol 188-189C (2004) 594. B.D. Beake, G.S. Fox-Rabinovich, Surf. Coat. Technol. 255 (2014) 102. GS Fox-Rabinovich et al, Surf Coat Technol 204 (2009) 489. B.D. Beake et al, Wear 418-419 (2019) 102. J. Chen et al, Surf Coat Technol 206 (2012) 4992.